It was half term for my daughters last week and inevitably my normal routine – in as much as you can call what I generally do a routine – went up the proverbial Swanee River. All the ribbons are done – I’m working on the backgrounds. I’m not a fan of huge areas of plain colours, so I’m experimenting with swirls and shading. 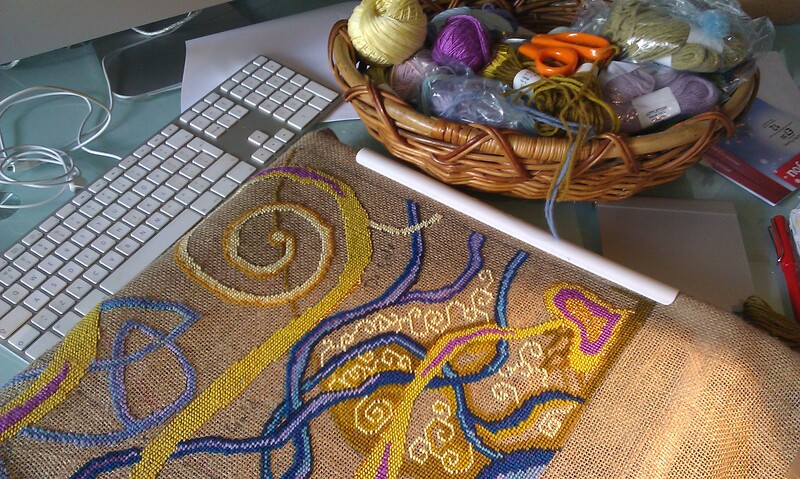 I’ve also given in to temptation and included some sparkly gold thread – although it doesn’t photograph well. I’ve been stitching this morning in the office/dining room/studio/junk room, because I missed huge chunks of the play on Radio 4 extra on Saturday and was determined to hear it properly on iPlayer. The only way I can do that is on the Mac – I really must see if there’s any way to get a comfy chair in here – it just doesn’t feel right, sewing in the office chair. In typical English fashion, the moment the children go back to school, the sun comes out, but we had a good week, even managing a trip to London, so can’t complain. Now we have the run up to Christmas to contend with – oh joy. My goodness, it is just stunning! Beautiful. Thank you – I’m pleased you like it. 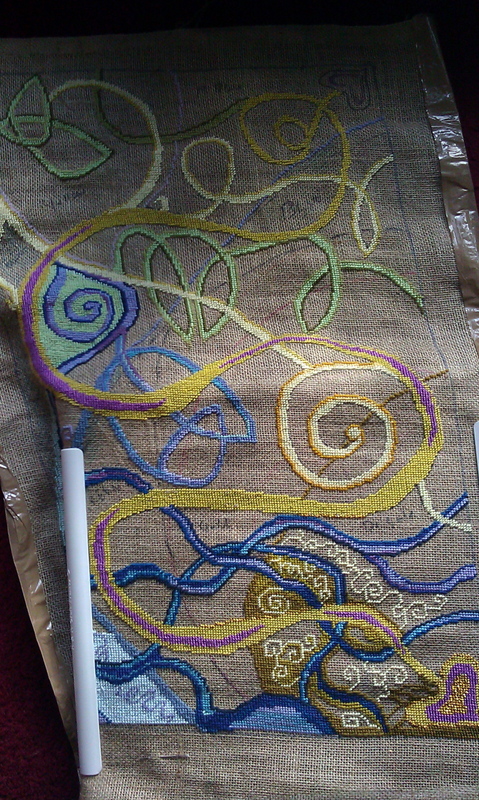 I’m rapidly running out of gold/yellows at the moment, so I’m going to have to go out in search of more – this canvas seems to eat thread! Thank you. I am a bit of a basket fanatic – there are lots of them hiding around the house, although I haven’t bought one for years now – you’d be amazed what you use them for! I have a little one by me, for my sewing bits and bobs, but it does have a tendency to eat small things if I’m not careful!